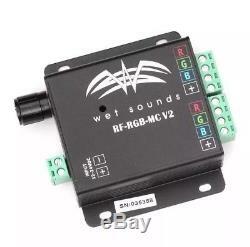 Part Number: RF-RGB-MC-V2 Wet Sounds RF RGB Multi-Function LED Lighting & Music Marine Speaker Controller. 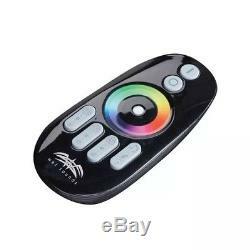 RF remote with touch-sensitive color wheel plus controller 3 music modes. LED lighting reacts with the beat of the music. 5 pre-programmed color changing modes. Can power up to 10 meters of LED lighting per controller. Choose your favorite single color to match your boat. Add a splash of color to your boat's speakers and get the party started with this Wet Sounds RF RGB LED Lighting and Music Controller. This remote controls your LED speakers using pulse width modulation remote control technology to give color to your water festivities. There are 3 music modes that react with the beat of the jams, 5 pre-programmed color changing modes, and it can power up to 10 meters of LED lighting. Choose your favorite color to match your boat and set the mood with the built-in dimmer control. 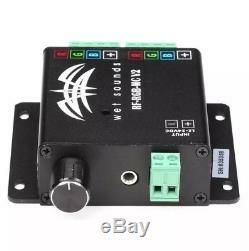 It has 2 output channels, a range of 20 to 30 meters, and can be connected to your smartphone. Life is better in color and with this Wet Sounds RF RGB LED Lighting and Music Controller, your lake day just got a whole lot more groovy. 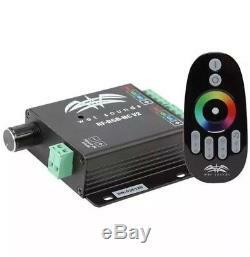 Built-in dimmer control Remembers last mode when turned off and on Can also be connected to a marine receiver or Android/Apple smartphone Range: 20 to 30 meters Wireless frequency: 433.92 mHz Output: 2 channels (RGB) 12-volt, 7.5A input. If you have any questions please contact me! Check out my other listings! The item "Wet Sounds RF RGB Multi-Function LED Lighting & Music Marine Speaker Controller" is in sale since Sunday, September 03, 2017. This item is in the category "Consumer Electronics\Vehicle Electronics & GPS\Marine Audio". The seller is "powersportzpro" and is located in Adams, Tennessee. This item can be shipped to United States, Canada, United Kingdom, Denmark, Romania, Slovakia, Bulgaria, Czech republic, Finland, Hungary, Latvia, Lithuania, Malta, Estonia, Australia, Greece, Portugal, Cyprus, Slovenia, Japan, China, Sweden, South Korea, Indonesia, Taiwan, South africa, Thailand, Belgium, France, Hong Kong, Ireland, Netherlands, Poland, Spain, Italy, Germany, Austria, Israel, Mexico, New Zealand, Philippines, Singapore, Switzerland, Norway, Saudi arabia, Ukraine, United arab emirates, Qatar, Kuwait, Bahrain, Croatia, Malaysia, Brazil, Chile, Colombia, Costa rica, Dominican republic, Panama, Trinidad and tobago, Guatemala, El salvador, Honduras, Jamaica.